While you can't go back in time, the violet flame has the power to erase, or transmute the cause, the effect, and even the memory of our past mistakes. Transmutation means to change - to alter in form, appearance or nature. 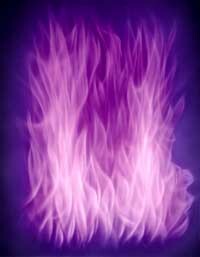 The violet flame changes negative energy into positive energy, darkness into light, “fate” into opportunity. The flame also erases the resultant bad karma of our mistakes. 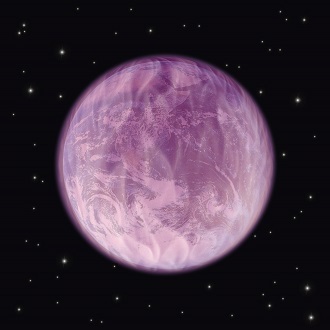 The violet flame works by changing “vibrations”. In physics, vibration is the speed of oscillation - the speed at which something moves back and forth. On the atomic level, vibration can be understood to be the speed at which electrons orbit around the nucleus of the atom. The violet flame works by changing vibrations on this level. In medieval times, alchemists attempted to transmute base metals into gold, using heat to separate the “subtle” from the “gross”. While there have always been alchemists who sought to create wealth by transmuting base metals, this process of transmutation is symbolic of a higher and more noble alchemy - the alchemy of self-transformation. Alchemists of all ages have sought the mystical philosophers' stone. Early alchemists pored over minutely ciphered texts in search of this stone. For them, it was worth a lifetime to decode the mystery of this “stone” which symbolized the transmutation of the lower animal nature into the highest and divine. The coveted philosophers' stone - “the stone which is no stone” - was not physical, but spiritual, and created out of fire. Some alchemists did discover the secret of the violet flame. According to Neoplatonist alchemists, the philosophers' stone was a self-transforming fire that would lead their souls upward, by drawing up to the Spirit all qualities which dragged downward and opposed the spiritual essences. In the process, the "hard and refractory materials" in their bodies would be transmuted into a rare and more luminous material. In this sacred experiment, they said the alchemist would become "like the gods" pursuing "the gold of the wise and not the vulgar metal". 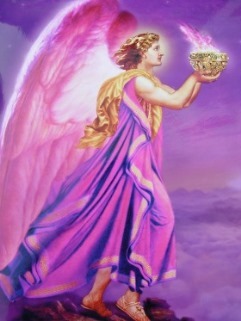 The violet flame is invoked through “decreeing” - a unique form of spoken prayer utilizing visualization and meditation. One of the simplest decrees to the violet flame is: “I AM a being of violet fire! I AM the purity God desires!” Take a few, slow deep breaths and center in your heart. Start out slowly, giving the decree with love, devotion and feeling. Repeat the decree three or nine times to begin with; you can gradually increase this to 36, 72 or even 144 repetitions. Repeating the decree strengthens its power and draws down more light. 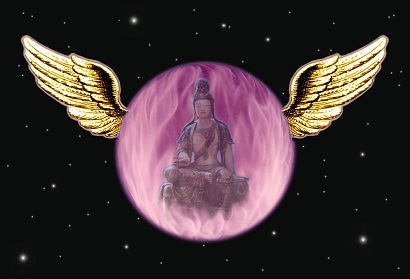 Please help spread the knowledge of the violet flame (and create some good karma :) by supporting this website. or email the author. Also see How to pray: Keys to effective and powerful prayer.